through a non-verbal expressive form of therapy. like to express themselves through the visual arts. can all benefit from art therapy. Do you need to be artistic to do art therapy? 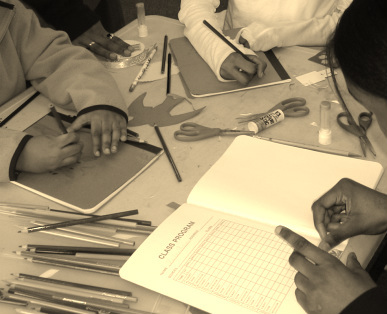 The focus in art therapy is on the individual and their personal process in the art making. It is not on how well one can draw or paint. How is art therapy different from art classes? Becoming more skilled at a certain process like drawing may be a benefit of art therapy, but is not the main goal. Art products are used to help individuals understand and interpret their feelings about personal issues. 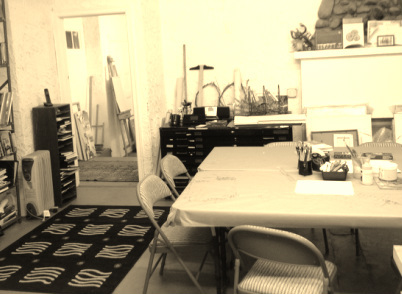 At Art Therapy on Hudson art therapy sessions are conducted in the studio which is equipped with a variety of art media - from pencils to pastels, paint, clay, fabrics, mixed media and collage elements. You can have individual sessions or be seen in a group if one is available. During an initial session you might be asked questions or to do specific art tasks as a way to assess your needs. Some art therapists give specific tasks and others allow you to choose what you want to do. At Art Therapy on Hudson I generally work both ways depending upon what your particular needs are. Sessions can involve talking or just making art or a combination of both. Usually there is some form of dialogue or reflection about your art and process at the end of the session. At the moment I do not have any art therapy groups, however group sessions may involve cooperative or individual projects. Verbal dialogue may be focused on a particular issue such as socialization. Cooperation and reflection on art products among group members is encouraged. Individual sessions are 60 min and groups are generally 90 min. art processes, and art history. They must have completed a masters level course of training in a program certified by the American Art Therapy Association. They must also be registered with the American Art Therapy Association-or have their ATR. In NY state they must also be board certified and have a creative arts therapy license or LCAT. the following credentials after their name: ATR-BC, LCAT. This indicates that they have obtained the highest level of training. "Look at the good you've done. You've really helped me in so many ways. My eye has really developed and I've even had a photo in an exhibit. You are a success at what you do!" "Mia de Bethune is a phenomenal helping professional who inspires creativity in the populations she serves. Having had the opportunity to work with her and the teen boys under her supervsion, providing my creative services was a welcome opportunity. Ms. deBethune is patient, an earnest listener, honest and dependable, which allows this population to feel safe and open to the creative offerings made available to them. She is a consummate professional and a sterling example to her profession as a Licensed Creative Arts therapist."